Can IVF Treatments Reverse A Woman's Biological Clock? June 27, 2012  A woman over 40 who uses eggs donated by a younger woman has essentially the same chance of having a baby as she would have had in her 20s. That's according to a large new study that looked at the success rates of multiple IVF treatments for nearly 250,000 women across age groups. 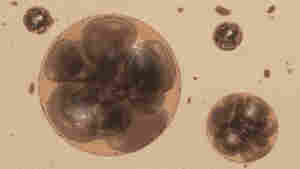 February 27, 2012  A series of experiments published in the journal Nature Medicine suggest young adult women have primitive stem cells that could generate new eggs. The findings are generating both excitement and questions. January 12, 2012  British researchers say the time has come to buckle down on the number of embryos used during in-vitro fertilization. Three or more is entirely too many, they concluded after looking at data on more than 124,000 IVF treatments.